When: W-2 forms must be mailed to recipients by January 31, and e-filed with the SSA by January 31 each year. State filing deadlines vary by state. Considered an “information return” by the IRS, the W-2, Wage and Tax Statement, is used to report an employee’s wages, tips and other compensation. The form also captures the withholding for various taxes, such as income, Social Security and Medicare. Like with the 1099-MISC for independent contractors, the person’s work status and the nature of his or her relationship to your business dictate which form you send. You’re required to issue a W-2 to each employee by January 31 for the previous tax year. When e-filing, you then have until January 31 to file the information with the SSA, which shares the data with the IRS. With W-2s, it’s essential that the name and Social Security number (SSN) on the form match the SSN on the employee’s Social Security card. This match allows the proper recording of the worker’s earnings to their lifetime earnings records, which later becomes the basis for determining the eligibility and amount of Social Security benefits. Be aware, too, that many states have W-2 filing requirements separate from federal filing requirements. 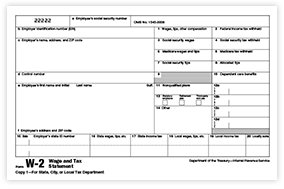 When to file: W-2 forms must be mailed to recipients by January 31, and e-filed with the SSA by January 31 each year. State filing deadlines vary by state. Not sure if a worker is an employee or contractor? Here’s help. Any renumeration, including non-cash payments of $600 or more for services performed by an employee.